Identification. In 1984, Thomas Sankara's revolutionary government changed the name Upper Volta to Burkina Faso, thus discarding the name the French had given their former colony. Burkina Faso is an artificial word, using linguistic elements from the country's largest languages: Burkina means "free man" in Mooré; Faso means "land" in Dyula. Burkina Faso is thus identified as the "country of the free men." Its inhabitants are called Burkinabè; the "bè" is a suffix from another language of the country, Fulfulde. Burkina Faso is a multiethnic nation with about sixty ethnic and linguistic groups. The country is roughly divided into two parts, each with different historical backgrounds and political cultures: the eastern and central regions were historically dominated by kingdoms, emirates, and chieftaincies such as the Mossi at the center, the Gurmanché in the extreme east and the Fulbe and Tuareg in the north. The western and southern regions contain a number of ethnic groups, which were politically less centralized. The largest of these groups are the Bisa and Gurunsi in the south, the Lobi and Dagara in the southwest, the Bobo in the west, and the Bwaba and Samo in the northwest. Location and Geography. The country covers 105,869 square miles (274,200 square kilometers) in the center of West Africa, north of Ghana and Ivory Coast. It is a landlocked, flat country with an average altitude between 650 and 1,300 feet (200 and 400 meters) above sea level. There are some elevations in the west, the highest point being the Tenakourou (2,457 feet; 749 meters). The largest part of the former Upper Volta lies within the catchment area of the three northern tributaries of the Volta river, the Mouhoun, the Nazinon, and the Nakambe (formerly the Black, Red, and White Volta). The capital Ouagadougou lies almost in the geographical center of the country. It was the capital of a powerful Mossi kingdom and became the seat of French colonial administration in 1919. The tropical climate has a wet season and a dry season. The northern Sahelian zone, which is adjacent to the Sahara desert, is much drier than the south, with only six to twenty-four inches (150 to 600 millimeters) of rain falling between June and September. In the southernmost Sudanic zone, rains usually start in May and end around October. Here the annual precipitation is from 35 to 51 inches (900 to 1300 millimeters). Rains show extreme variations from year to year, in both timing and quantity. They typically fall during short violent thunderstorms. The country's vegetation varies with trees and thick bush in the south and near-desert conditions in the north. The landscape changes dramatically according to the seasons. In the driest months, extreme drought and the Harmattan, a dusty cold wind from the Sahara, desiccate all vegetation; widespread manmade bushfires add to the burnt aspect of the landscape. With the first rains, leaves sprout on trees and bushes and the savannah grass grows to several yards within a few months. Dagara-Lobi, and Gurunsi are each between 5 and 8 percent of the total population. Linguistic Affiliation. French, the language of the former colonizing power, is the official language. It is used in schools, the army, the media, and by people who attend school if they are not from the same ethnic group. Since many people do not go to school, they have little or no knowledge of the French language. Widespread vernacular languages include Mooré in the center of the country and Dyula in the west; a few other languages are also used in radio programs and on television news. Among more than sixty languages spoken in Burkina Faso, thirty-eight belong to the Gur or Voltaic language family, including Mooré, Bwamu, Dagara, and Lobiri. The Mande language family includes twelve languages, such as Bisa, Sane, Dyula, and Bobo. Other language families include only one or two languages; the most important of these is Fulfulde spoken by the cattle rearing Fulbe people. Many Burkinabè grow up speaking several national languages as well as French. Symbolism. The national flag is divided in two equal horizontal fields, with red on top and green below; a yellow five-pointed star sits in the center. The national motto has been changed to reflect the political changes since the country gained its independence from France in 1960. The first motto, "Unity-Work-Justice," was changed 1984 during the socialist Sankara revolution to the Fidel Castro-inspired "fatherland or death we shall overcome;" the motto was changed again in 1991 during the "rectification" of Blaise Compaoré, to "Unity-Progress-Justice." The years of Sankara's revolution in the 1980s had a profound impact on the national identity. The country's symbols, such as the country's name and national anthem, were given renewed importance and reflect a pride in being Burkinabè. The national hymn highlights the ongoing anti-colonial struggle and the ideology of national pride that are part of the national character of the "free and upright men." National identity was also forged during two frontier wars (1974–1975 and 1985–1986) with Mali. Another important rallying point for national feelings is soccer: the national team ("Etalons" or Stallions) uses the symbol of the military strength of the Mossi kingdoms. Emergence of the Nation. Burkina Faso's ancient and precolonial history is only known in fragments, due to the lack of early and consistent written sources and the limited archaeological information available. Recent excavations have shown that rich and stratified societies lived in permanent villages in the northeast around the year 1000 C.E. In the south, the origins of the impressive but still undated "Lobi" ruins remain a mystery. The Mossi appear to have founded their kingdoms—the most important being Wagadugu, Yatenga and Tenkodogo—around the fifteenth century C.E. Written sources mention the Mossi in connection with raids on the Sahelian towns of Timbuktu and Walata, and throughout the Middle Ages as anti-Islamic enemies of the Mali and Songhay kings. Another early important precolonial kingdom was Gurma in the east. In the nineteenth century, several smaller states with an Islamic ideology formed, such as the Fulbe states of Liptako, Jelgooji, Barani, and the Marka states of Wahabu and Boussé. States like Kong and Kenedugu expanded into southern Burkina Faso. Within or between the spheres of influence of these states, politically non-centralized societies could maintain their autonomy and sometimes even expand. French colonial armies conquered and occupied the territory beginning in 1895, thus thwarting the northern advances of the concurring colonial powers Britain and Germany. After the First World War, which brought massive oppression, popular uprisings, and their bloody suppressions, the French carved out the Upper Volta colony as an administrative unit from French West Africa. In order to assure a supply of labor to the French coastal colonies, Upper Volta was dissolved in 1932 and its territory divided among the Ivory Coast, French Sudan (now Mali), and Niger. The traditional Mossi aristocracy and the emerging intellectual elite protested against the dissolution of Upper Volta, and their continued agitation was rewarded in 1947 by the reconstitution of the colony. After the reconstitution, some directly– voted deputies represented Upper Volta in the French parliament in Paris. These deputies, under their influential leader Ouezzin Coulibally, developed a true national conscience for the first time. During the 1958 referendum, a majority of the population preferred to remain a largely autonomous colony within the French-African Community instead of becoming independent. Nevertheless, one year later Maurice Yaméogo of the Rassemblement Démocratique Africain (RDA) declared the Republic of Upper Volta and became its first president. On 5 August 1960, Upper Volta proclaimed its national independence from France. Yaméogo adopted a pro-Western foreign policy while moving towards a single party political system and assuming almost dictatorial rights. In this, he followed the example of Félix Houphouët-Boigny, president of the Ivory Coast and leading RDA figure, who was very influential in Burkina Faso's politics following independence. In 1966, the army overthrew Yaméogo; the coup was encouraged by the trade unions, which were angered by Yaméogo's austerity measures. Sangoulé Lamizana, chief of army staff, served as the new president. The country alternated between periods of military and civil rule, and in 1977 and 1979 new constitutions were adopted, marking the short lived second and third republics. Colonel Saye Zerbo came to power in a 1980 coup, but was deposed in 1982 by a coalition of conservative and socialist officers; they installed Surgeon-Major Jean-Baptiste Ouedraogo as president. Thomas Sankara became his minister and later prime minister. Sankara was young, ambitious, and charismatic, a popular hero of the 1975 frontier war with Mali. He was a strident anti-colonialist and Marxist. Tensions within the government grew until Sankara finally ousted the conservative faction and took over power on 4 August 1993, backed by a number of left-wing parties and trade unions. The following four years profoundly changed the country's political and social landscape as Sankara introduced many reforms. His foreign policy embraced socialist countries like Libya and Cuba, and he promoted an anti-imperialist ideology of autarchy and national pride; many foreign development organizations were forced to leave the county. Dropping the old colonial name, Upper Volta, and choosing the new name, Burkina Faso, was derived from the indigenous languages, but was perhaps the most symbolically important of his measures. The political leadership along with Comity for the Defense of the Revolution (CDR), a mass organization with a presence in almost every village, encouraged mass mobilization and self-help. 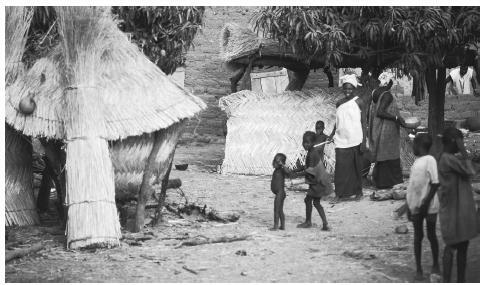 In Ouagadougou and other towns, vast housing programs were instituted; in the countryside, numerous schools and community clinics were built. Sankara also curtailed the elite's privileges: civil servants were dismissed or were forced to give parts of their salary for development projects; all traditional authorities were abolished, especially the powerful Mossi aristocracy. Drastic measures virtually eradicated corruption. The regime gradually moved towards a totalitarian system. Sankara, who became increasingly isolated, was killed on 15 October 1987 by the troops of his old friend and colleague, Blaise Compaoré. Sankara's violent death made him a martyr for his ideas; he remains an idol among the youth in Burkina Faso and other parts of Africa. In the years following the bloody 1987 coup, Blaise Compaoré embarked on a policy called rectification, meant to change most of the revolutionary policies of his predecessor. In 1990 Compaoré's party, ODP-MT (Organization for Popular Democracy/Work Movement, later the Congress for Democracy and Progress or CDP), renounced Marxism-Leninism. In June 1991, a new constitution marked the return to multiparty democracy and the beginning of the fourth Republic. In the December 1991 elections however, Compaoré was voted president under unusual conditions: the opposition had boycotted the elections, Compaoré was the sole candidate, and only one quarter of the voters turned out. In the following years, the opposition was divided into old conservative parties and a multitude of revolutionary Sankarist groups disillusioned with Compaoré's rectification. The opposition, which denounced the government's lack of equity and transparency, again boycotted the 1997 presidential elections and presented no convincing candidate. Compaoré was reelected with 87.5 percent of the vote, and a voter turnout of 56 percent. The fourth Republic is marked by a reorientation to the West. The International Monetary Fund (IMF) imposed a structural adjustment program that is meticulously followed; current political stability makes Burkina Faso, one of the world's poorest countries, a prime destination for Western donors. In the late 1990s, the amount of development funds flowing into the country exceeded the central government expenditures. Ethnic Relations. The population of Burkina Faso has always been highly mobile. The landscape provides few natural barriers and the traditional economic activities of shifting cultivation, semi-nomadic pastoralism, and trade require some degree of migration. Today's ethnic groups are the result of this high level mobility. Cultural exchange—even assimilation—and linguistic flexibility were frequently more important than cultural difference. But clear ethnic identities did sometimes develop in precolonial times, and the colonial transformation of the political landscape sometimes favored the hardening of ethnic borders. Generally, though, community networks transcended ethnic boundaries; this is especially true for long distance traders like the Dyula or the Yarse, and for the semi-nomadic Fulbe. Limited economic resources in the overpopulated central plateau also resulted in the migration of the Mossi people to all parts of the country during the twentieth century. The nation's boundaries were inherited from the colonial powers. These had demarcated them in a sometimes arbitrary way, separating people from the same ethnic group while enclosing people without any cultural or historical affinities. In spite of this, a national identity has formed and there are currently no serious separatist movements and no major ethnic conflicts. One reason may be the importance of a powerful cultural device, the joking relationship, which helps to ease potential tensions. When joking partners—they could be strangers or friends—meet, they insult each other in a sometimes rude but always humorous way; it is absolutely forbidden to take any offence. Joking relationships are highly developed among many ethnic groups, especially between the Mossi and Samo, the Bisa and Gurunsi, the Fulbe and Bwaba/Bobo, and the Guin/Karaboro and Lobi/Dagara. A predominantly rural country, about 90 percent of the population lives in more than eight thousand villages. The highest population density (over fifty persons per square km) is in the center, in the socalled Mossi plateau. This contrasts with the large, virtually uninhabited spaces in the southwest, the extreme east, and the north—where the majority of the national parks are located and land use is highly restricted. The late twentieth century saw a rapid increase in urbanization, illustrated through the exponential growth of the capital Ouagadougou. Its population grew from approximately 100,000 in 1970 to 752,236 in 1996. One of every two people living in cities lives in Ouagadougou; the city's growth rate is estimated at 6.4 percent annually. The capital's growth is partly at the expense of the country's second town, Bobo-Dioulasso. With about the same number of inhabitants on the eve of independence, Bobo-Dioulasso is today less than half as populated as Ouagadougou (312,330 inhabitants in 1996). No other city approaches these two in population. Traditional architecture varies by region and ethnic group. It ranges from the temporary straw hut of the Fulbe and the tent of the Tuareg to the round hut made of adobe bricks and covered by a straw roof (used by the Mossi, Bisa, and Gurmanché). In the south, the Bobo, Dagara, Gurunsi, and Lobi build huge, castle-like houses with solid wood and mud walls and flat roofs. Over a hundred persons can live in these structures, which are sometimes colorfully decorated. Villages in the south may consist of a dozen widely-dispersed huge houses. Markets in the center of villages and towns are not only spaces for commercial activities but communication centers were news is exchanged, marriages are arranged, and company is enjoyed. Imported building material, such as the zinc sheets for roofing, is becoming increasingly important in the countryside. In cities, large boulevards, representative roundabouts, football stadiums, and multi-storied administrative buildings like the headquarters of the Economic Community of West African States in Ouagadougou symbolize modernity. An entire new quarter, called Ouaga 2000 and containing villas, embassies, and a congress center, has been built on the southern fringes of the capital. There is a drastic disparity between cities and the countryside in matters of revenue, health, education, and general infrastructure. Food in Daily Life. The main staple food is tô, a kind of paste prepared with millet or corn flour. It is eaten lukewarm and accompanied by a sauce. The most popular sauces are made with baobab and/or sorrel leaves and contain condiments, which vary from region to region. Shea butter or groundnut paste is frequently added. In the southernmost regions yams are grown and eaten, while in the north, especially among the Fulbe, milk is an important part of diet. Local delicacies also include a kind of caterpillar which is highly cherished among the Bobo and which is very nourishing due to its high protein content. In rural areas, meat is rarely eaten. Livestock is primarily kept not for nutrition but to pay a bride price or to offer sacrifice. The exception is the weekly market where meat is prepared and sold. Frequently this is pork baked in an oven, considered a delicacy. In urban areas rice and pasta have replaced tô. In the morning wooden kiosks offer customers a breakfast of coffee, fried egg, and fresh French-style baguette. In Ouagadougou and Bobo-Dioulasso there is an array of international restaurants with French, Italian, Chinese, and Lebanese cuisine. In the evenings, upperclass people sit outside in garden restaurants where beef barbecue, fried fish, and chicken are served with bottled beer. There are two national brands, Sobbra and Brakina. For the majority bottled beer is too expensive, and they drink the popular locally brewed millet beer called dolo instead. It is always prepared by a woman, the dolotière, who runs a bar called a cabaret. Dolo is served in a calabash after having been cooked for over three days in huge jars. The preparation of dolo is an important income for rural women and the millet beer varies in strength and taste according to region. Bangui is a palm wine made in the Banfora region. Other locally-prepared drinks are liquor, soured milk ( gappal ), and juice made from the fruit of the tamarind tree, ginger, or bissap leaves. In the north and west, tea plays an important role. Food Customs at Ceremonial Occasions. Meat is rare in daily dishes, but is eaten during ceremonial and ritual occasions including wedding ceremonies, celebrating the birth of a child, and funerals. All ethnic groups celebrate local festivals during which special food is prepared, and local beer is frequently consumed. Muslims celebrate Tabaski, the Islamic 'Id al-Kabir (or 'Id al-Adha), which includes the sacrificing and eating of a ram by each family. During the month of Ramadan they are only allowed to eat and drink after sunset. Basic Economy. One of the poorest countries in the world, the average person has a yearly per capita purchasing power parity of only $860 (1997 World Bank estimate). The country is landlocked, and has few natural resources and a fragile tropical soil, which has to support a comparatively high population density. Overgrazing and deforestation are serious problems which have lead to soil degradation, erosion, and desertification. About 85 percent of the population is engaged in agriculture, almost entirely at the subsistence level. Less than 10 percent of the agricultural production is cash crops. There is little irrigation and people practice mainly rainfall hoe culture, which is highly vulnerable to variations in precipitation. In all regions, the rainfall pattern tends to vary dramatically from year to year in timing, quantity, and regional distribution. There are good and bad years and this may change from one village to the next. Recurring droughts are the most dangerous natural hazards, sometimes leading to famine. The typical short, violent storms contribute to problems of soil erosion and crop damage. The most important crop is millet (sorghum and penisetum). In certain regions corn, rice, groundnuts, vegetables, and yams are cultivated. The savannah environment is ideal for extensive livestock grazing, except for those southern areas infested by tsetse fly. The country supports an estimated four million cattle and almost fourteen million sheep and goats. Most agricultural communities do have some livestock, but the Fulbe and Tuareg of the northern regions are considered real pastoralists. Although most communities have permanently settled, they cherish the semi-nomadic lifestyle and many Fulbe still follow their herds of cattle. Meat is inexpensive and animals are exported to the coastal countries. The main export remains labor. Since early colonial days, migrant laborers from Burkina Faso went to work in the gold mines and plantations of Ghana and the Ivory Coast. Today more than a million Burkinabè live permanently in the Ivory Coast and many more are seasonal migrants. A considerable number of Burkinabè live in France. Land Tenure and Property. According to law, the state owns all land. Large areas have been declared national parks or used for state-assisted development schemes. Wild hunting, fishing, and wood cutting are not allowed. Illegal access to these resources often brings villagers into conflict with the agents of the national water and forest administration. In towns and cities, urban space is divided into plots for which individual property titles can be acquired. In recent years, the allotment of plots is speeding up in towns and on the outskirts of the bigger cities. In rural communities, access to land is dictated by length of settlement: the lineage or clan whose ancestor is said to have founded the settlement has special rights to land, and usually provides the earth-priest. This essentially religious office holder is also necessary to legalize land rights, regulate land-use claims, and determine where houses may be built. In former kingdoms or chiefdoms, land disputes were frequently settled before the traditional ruler or Muslim authorities. The coexistence of cattle herders and agriculturalist in many areas carries a high potential for conflict. The national body for land use planning attempts to mediate these conflicts at the local level. Wealthy individuals, investors from the cities, and village associations sometimes work big fields in the bush to grow cash crops, mainly cotton. Other big agricultural enterprises are state owned, like the large irrigated sugar cane plantations near Banfora. 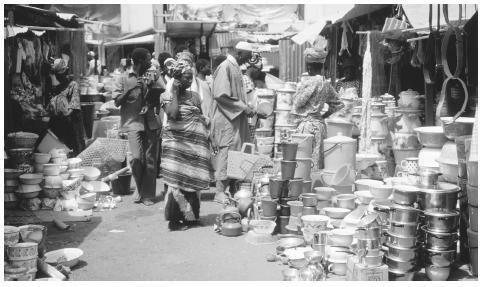 Traditional household equipment stands on sale next to modern Western items in a market in Bobo-Diolasso. Commercial Activities. Most of the country's commercial activities fall within the informal economy. There are many small traders and craftsmen, with the most successful established in permanent shops in the urban central markets. A growing artisan community produces souvenirs such as woodcarvings, leather- and basketworks, and speciality fabrics for the expanding tourism market. Major Industries. Generally, unprofitable government-controlled corporations still dominate industry. but in recent years more emphasis has been given to the private sector. In compliance with IMF guidelines, a number of state companies have been privatized since 1991. This rarely yielded the expected results, yet there are signs for economic progress. Following the African franc currency devaluation in January 1994, the government updated its development program in conjunction with international agencies, and exports and economic growth have increased. Agro-industry accounts for over 55 percent of the overall industrial production and is dominated by the powerful cotton processor Société de Fibres Textiles (SOFITEX). Bobo-Dioulasso was once the country's industrial center due to its fertile agricultural land and, since 1933, to the railway connection with the Ivory Coast. After independence, industries and businesses are have progressively shifted towards the capital Ouagadougou. Gold is the third most important export item after cotton and animal products and is a fast-growing industry. The nonindustrial mining sector employs thousands of mobile freelance miners who extract gold with primitive technology and are largely uncontrolled by the state. In the late 1990s, several dozen international mining companies began operations in the country, prospecting and exploiting the known gold deposits. Trade. Almost all external trade is with countries to the south, especially with the harbors in the Ivory Coast and Togo. The few tarred roads are the connection to the coastal countries, along with a railway line to Abidjan. According to 1997 estimates, the country had a strong trade deficit: imports totaled $700 million, while exports were worth only $400 million. Main imports are machinery and food products, corn, barley, and rice, as well as fuel for transportation and to generate electricity. Cotton is of increasing importance, accounting for 73.4 percent of national exports. Meat, livestock, and hides are also important; gold and agricultural products such as green beans, mangos, sesame, groundnuts and shea butter make up the remaining exports. Division of Labor. The state is the country's largest employer. Civil service jobs are preferred to work in the private sector, as job security is much higher and while wages are low, they are paid regularly. Competence is important in civil service recruitment, but kinship and regional affinity play important roles. Since the implementation of a structural adjustment program, employment in the civil service has been drastically reduced, except in education, health, and tax administration. Frequently one person's income must feed many people. While the official pension age for employees is between the ages of fifty-three and fifty-five, people in subsistence agriculture work as long as their health permits. They also start at a young age, as work is considered part of children's education. Classes and Castes. Many of the country's traditional societies have their own hierarchies. The Mossi society differentiates between aristocrats (Nakomse), commoners (Talse), and slaves or captives (Yemse). The Nakomse are people of power whose ancestors were horse-riding warriors and founders of the Mossi kingdoms. They were not necessarily rich in a materialistic sense, but they controlled people. They had many followers and they took slaves, which were frequently integrated into their families. The offspring of these slaves can hardly be differentiated from other people, yet their slave origin may still be remembered. In other societies too, a family's slave origin is known; most obvious is the demarcation between nobles and slaves in the extreme north among the Tuareg. Apart from class stratification, individuals are also categorized by occupation. In the west, which is influenced by Mande tradition, blacksmiths and praise singers (Griots) form caste-like groups (Nymakallaw) and are sometimes feared for their occult powers. There are also groups of traders, the Dyula in the west and the Yarse among the Mossi, who are generally respected. Social and material inequality increased dramatically during the 1990s. Equality was one of the main principles during Sankara's time; flashy cars were confiscated and even high state officials had to work on farms and participate in the daybreak mass sports. Since the 1994 devaluation of the African franc, the situation has changed. Unemployment and poverty has increased in spite of a growing economy. A few individuals have acquired great wealth, seen by many as proof of growing corruption and a flawed privatization policy. Symbols of Social Stratification. Obvious social inequality is still shocking in an environment of widespread poverty, and wealth is not generally advertised. While more huge villas with satellite dishes are being built and expensive cars make their appearance on Ouagadougou's streets, there is a certain carefulness in the display of wealth. Thus the uniform dress code of the Sankara time, the Faso Danfani, is widespread even among the wealthy. An exception is the rich Lebanese community, which controls many profitable businesses. Government. The political system of the fourth Republic is based on a constitution which is inspired by the French presidential democracy. The parliament has two chambers. The Assemblée Nationale has 111 members elected by popular vote every five years. Each of the forty-five provinces has a fixed number of representatives. The Chambre des Représentants was instituted in 1999 and is purely consultative. The 120 appointed members are representatives of religious groups, traditional rulers, trade unions, women's organizations and other social groups. The cabinet with thirty-five ministers is headed by the prime minister who is named by the president. The president, the real power center in the political structure, is elected by popular vote for a seven-year term. There is no limit in the number of terms a president may serve. Constitutional changes may soon shorten the term of office to five years. Leadership and Political Officials. The political class is a limited group, where most personalities know each other well. This is both because Burkina Faso is a small country and also because much of the elite studied abroad in the same universities, in either Paris, where the country maintains a student hostel in the rue Fessart, in Dakar, or in Moscow. Political leaders who were student activists have replaced the first generation of politicians active before independence. Many of today's political class came up during the Sankara revolution and were part of the CDR, an institution created by Sankara to enforce revolutionary ideals. Political agendas are often secondary, and political parties are seen as pressure groups used to bring a certain set of people to power. Nevertheless, politicians are seen as regular people who may be approached like anybody else, not as a detached elite. People stand by huts in a Bobo village in Burkina Faso. The majority of citizens, about 90 percent, live in rural areas, among Burkina Faso's 8000 villages. The biggest political party is the Congrès pour la Démocratie et le Progrès (CDP). The main opposition parties are the Parti pour la Démocratie et le Progrès (PDP), mainly rooted in the west, and the Alliance pour la Démocratie et le Fédéralisme— Rassemblement Démocratique Africain (ADF-RDA), with a strong base in Yatenga province and in the town of Koudougou. Efforts have been made to unite the extra-parliamentarian opposition in the Group of Fourteenth, a coalition with changing constituent parties and political pressure groups founded on 14 February 1998. Social Problems and Control. Crime rates are rising, but traditionally have been very low. Thieves may be lynched in some rare cases, a practice disappearing due to campaigns of national human rights organizations. Criminals are usually delivered to the police or the gendarmerie, a military police with a reputation of an uncorrupted elite force. Armed robbery is still a very rare phenomenon. Social unrest comes from students and politicized youth—political demonstrations sometimes turn into violent scenes. These demonstrations increased after the murder of the critical and very popular journalist Norbert Zongo in December 1998. This crime, attributed to the immediate entourage of president Compaoré, catalyzed widespread discontent with the political regime and created a volatile political situation with frequent strikes and social unrest. Military Activity. After the frontier wars with Mali in the mid-1970s and 1980s, the country had no military conflicts with its neighbors. However, some African countries criticize the nation for its contacts with rebel groups: According to a UN report, some political leaders are involved in illegal arms and diamond trafficking with rebel groups in Angola and Sierra Leone. State employees and employees in parastatals and larger private companies benefit from social security, but for the vast majority there is no social welfare. The numerous development projects are an important economic and social factor. They can be multilateral like those financed by World Bank, United Nations, or the European Union, or they can be initiated by national development agencies. The most important donor countries are France, Germany, Netherlands, Denmark, the United States, and Japan. Furthermore, hundreds of nongovernmental organizations (NGOs) such as charity organizations, churches, town partnerships, and initiatives by concerned groups and individuals are working on various development related issues in the fields of health, education, and poverty relief. Public education campaigns target issues like female excision and the sustained development of natural resources. In the villages, solidarity groups of men, women, and youth form to propose concrete development projects to donors. Division of Labor by Gender. In most rural areas both women and men work in agriculture. Men are expected to furnish the millet, while women are in charge of all other things. In an urban context, this is translated into the man's responsibility to give "Naã Songo," "the money for sauce." Male and female tasks in rural areas are clearly differentiated. Hunting and butchering is always a male activity while the collection of firewood and water is seen, among other duties, as female tasks. In the urban sector, women are employed in almost all positions, though to a lesser degree than men. Girls in the modern cities are encouraged to pursue higher education and many scholarships are reserved for them. The Relative Status of Women and Men. A woman's role is considered to be that of a wife and mother; a woman in her thirties who is unmarried or childless carries a severe social stigma. A married woman who is childless— barrenness is usually attributed to the women—bears enormous pressure from her husband's family and is likely to be sent away without any material resources. The family head is always a man, who represents the family to the outside world. Nevertheless, women have a good deal of say in domestic and economic matters and they may be successful in commerce or other jobs. Besides her job, a career woman is expected to raise children and to fulfill domestic tasks. She is aided in this by relatives from the village who regularly perform household tasks for urban families. Marriage. Today arranged marriages, which were the rule in former times, are rare, especially in urban contexts. In a customary marriage, the husband pays bride price to the bride's family. The amount varies according to ethnic group from symbolic to substantial contributions that take many years to acquire. The differences in bride price tend to hinder interethnic marriages, which are nevertheless practiced among a number of neighboring groups. Women join their husbands after marriage, and this forges an alliance between two families. Divorce is possible; any children stay with the husband's family, and the family receives the bride price should the woman remarry. If the husband dies, the widow is expected to marry a brother of her late husband. The World Bank estimates that about one-third of households are polygynous. Polygyny is practiced in traditional and Muslim contexts, but is opposed by the Christian churches. Urban and educated people may choose to have a civil marriage. Progressive family law gives many rights to women; some men even refrain from marrying at the registrar for fear of having too many duties in case of divorce. Domestic Unit. Extended family is very important and relatives from the husband's or wife's side may live together with the nuclear family. Three, four, or more generations living under one roof is common. Average household size is more than eight people in rural areas and more than six people in urban areas (World Bank). Especially in rural areas, a number of related households may live together in a compound. Old age and experience are highly regarded; generally the head and authority of the compound is a family elder. Inheritance. A deceased man's widow and brothers decide the inheritance. If there are sons of a mature age, the property goes to them and they take care of their mother. According to modern family law, even illegitimate children have the right to inherit from their father. Customary law shows numerous variations according to ethnic group, but usually there are quite precise rules on inheritance. Belongings may be handed down both in the mother's as well in the father's line. Children are usually considered to belong to the father's family; illegitimate children, though, are considered to belong to their maternal uncles. 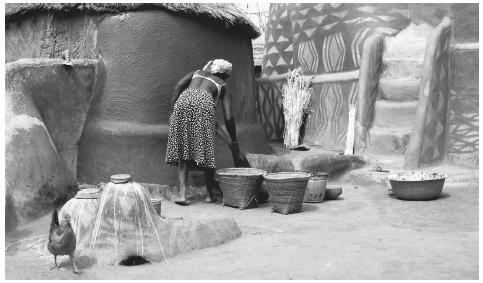 A Burkinabè woman sweeping her compound kitchen. Men and women have equal responsibilties in the agricultural sector of rural areas. clan or lineage can be made up of several thousand persons which may be dispersed, with each settlement made up of members of different clans, or as a locally defined unit on its clan territory. Marriage partners come from outside the clan. While in precolonial times clans were important for assistance in economic matters and warfare, they now serve as mutual assistance networks for city dwellers and as pressure groups for political office. Infant Care. Infants and children up to two or three years have almost constant physical contactwith the mother, an aunt, or an elder sister. They are regularly tied with a wrapper to a woman or girl's back and carried around while the woman does domestic work or is farming. Elder siblings are strongly involved in rearing the younger ones; especially the first-borns have much responsibility. Child Rearing and Education. Infant care and child rearing is the responsibility not only of the biological parents, but of the whole compound and, in rural areas, the entire village. The aim of all education is not to encourage an individual personality but to integrate children into the social environment. Primary school education starts at age seven. About one third of all children go to primary school; in urban areas the rate is about three times as high as in the countryside. In many villages, children walk for hours to reach the school. Classes are quite large, with an average of about fifty pupils. School attendance varies according to region and gender: Most of the southern and western provinces have attendance rates of fifty percent and more, while in some northern and eastern provinces less than twenty percent attend school. Nationally, two girls for every three boys attend primary school, and only half as many girls as boys go to secondary school. Higher Education. The University of Ouagadougou, founded only in 1974, dominates higher education with about eight thousand enrolled students. In 1997, the Polytechnic University of Bobo-Dioulasso opened its doors. The école Nationale d'Administration et de la Magistrature (ENAM) in Ouagadougou trains higher state officials, and the école Normale Supérieure (ENS) is in Koudougou. All together about ten thousand students are enrolled in post-secondary schools, less than one percent of the population. Only one-third are women. University graduates are a tiny and respected elite, carrying the hopes of their parents and sometimes of an entire ethnic group. Even for university graduates, however, it is increasingly difficult to find jobs. Hospitality and politeness is important to the Burkinabè. Salutations are an elaborate procedure always involving shaking hands. Conversations are rarely direct, and general issues are discussed first to set everybody at ease. Women are expected to refrain from wearing very short skirts and low-cut dresses, and from smoking in public. Officials and uniformed people are always approached with respect. They and official buildings should not be photographed. When the national flag is lowered, everyone is expected to stand still. As a rule, elders, even if only a few years older, are treated with high respect. Religious Beliefs. A tolerant country in matters of religion, Burkina Faso has no major conflicts between the religions. Approximately 45 percent continue to hold traditional beliefs. About 43 percent practice Islam, which has been strong for centuries among the Marka, Dyula, and Fulbe, and since the colonial era among the Mossi. Christianity, spread by missionaries in colonial times, is mostly rooted in the south, the west, and among the urban elite; 6 percent are Roman Catholics and 6 percent Protestant. Religious Practitioners. Muslims have the Iamam who leads the Friday prayer, and Christians have the standard clergy. In traditional religion, there are many religious offices and functions, but hardly any full-time religious specialists. Each ethnic group has its own specialists. The most important ones may be labelled earth priests, fortunetellers, rainmakers, or healers. Religious practitioners are chosen through family tradition or because they are called by a spirit. Traditional religion is tolerant, non-proselytizing, and flexible. Certain cults and religious specialists gain popularity beyond the local level because people feel that they can offer effective help for certain problems. Witchcraft and magic are powerful antisocial forces, but they are important in every-day life and ensure adherence to cultural norms. Man sitting at entrance to painted hut. There are stark differences in the infrastructure of the countryside versus the city. are offered to a wide range of spiritual forces symbolized by shrines or by conspicuous natural features such as hills, rocks, caves, trees, crossroads, termite hills, rivers, and ponds. Traditional compounds may contain dozens of shrines and power objects. A number of ethnic groups practice initiation rituals for youth. Others have powerful secret societies, which perform with masks on certain occasions. The monotheistic religions have their own holy places. Among Catholics there is a strong cult of Saint Mary, and a number of sanctuaries have been erected for veneration. The Muslims honor some of the old mosques from the early times of Islamization, like the ones in Bobo-Dioulasso and Ouahabou. Death and the Afterlife. Hardly any death is considered natural, especially in case of accident or the death of a younger person. Fortunetellers or necromancers may be consulted to find out whether the victim either transgressed certain socio-cultural norms or was a victim of witchcraft. Among Muslims, burial takes place within 24 hours, and is devoid of much ceremony. Traditional believers in most ethnic groups, however, celebrate long and elaborate funeral rituals to elevate the deceased to the sphere of the ancestors. The ancestors are integral part of the living community and are thought to affect lives; in many places, they are worshipped in special shrines. Christian churches adapt in different ways to these beliefs. Knowledge of traditional healing methods is quickly declining. Some specialists still know much about herbs, roots, and barks and the traditional bonesetters are still consulted in rural areas. Psychological problems are treated through possession rituals. Western medicine, however, has made profound impact. Vaccination campaigns reach even remote settlements and at village markets medicinal pills and tablets can be purchased. They are comparatively cheap but of doubtful quality. Bigger villages have a dispensary run by a nurse. Although treatment is free, the prescribed drugs are quite expensive. Medical treatment by a doctor or in hospitals is much too expensive for the average person. National holidays honor independence and the Sankara revolution: On 11 December 1959, the Republic was proclaimed and on 5 August 1960, Upper Volta became independent. The revolution is honored on 4 August, the date when Thomas Sankara came to power in 1983. His death in 1987 is remembered on 15 October. In former kingdoms, royalty is celebrated in yearly festivals. Every Friday morning the Mogho Naaba, king of Ouagadougou, makes a public appearance with his court in front of the palace. A more modern introduction are carnival-like mask processions in Ouagadougou, such as Carnival Dodo or Carnival Salou. The National Week of Culture (SNC) is celebrated annually in Bobo-Dioulasso. All artistic expressions are united there: theater, music, dance, sculpture, literature, and cinema from all corners of the country, along with exhibitions, cooking contests, horse races, and traditional wrestling. Support for the Arts. The state promotes artistic expression through help in organization, logistics, and infrastructure more than by direct funding. A number of different festivals are organized, including the successful biennial Pan African Film Festival (FESPACO), held in Ouagadougou since 1965. The festival attracts more than 5,000 participants and has aided the development of francophone African cinema. Literature. In a society where the majority is illiterate, oral tradition is central to pass history and culture from generation to generation. A number of ethnic groups have Griots, specialized narrators; in others youth is taught by elders during initiation rituals. There is also a written literature including works by well-known writers like Augustin Sondé Coulibally, Jean Baptiste Somé, and Monique Ilboudo which are read in schools and have been honored through national awards. A major obstacle for the development of a national literature is the scarcity of publishers. Graphic Arts. Sculpture in wood, leather- and basketworks, hand-dyed fabrics, lost wax casting, and pottery are highly-developed traditional crafts. Many objects such as masks, figurines, and music instruments are produced for use in sacred contexts and are seen as power objects. A growing artisan group produces souvenirs and art pieces for the expanding tourism market. They may recall traditional forms or be of modern artistic expression. The showroom for this production is the biennial International Arts and Crafts Fair (SIAO) in Ouagadougou, attended by many artists of neighboring countries. Arts and craft production is also shown in Ouagadougou's National Center for Arts and Crafts (CNAA), where artists are trained and work together. Performance Arts. A number of theater and music festivals are held; among the most important are the National Culture Week (SNC) in Bobo-Dioulasso and the Atypical Nights of Koudougou, a theater festival. Individuals also celebrate occasions like births or weddings with spontaneous music and dance. Dancing and music groups exist for all occasions, and Bobo-Dioulasso's Djembe drumming tradition is internationally famous. Scientific research is aimed primarily at promoting economic and social development. The National Scientific Research Center (CNRST) has a number of institutes in many disciplines, sometimes working in cooperation with foreign research bodies. While the country adopts technological innovations from abroad, efforts are also made to understand indigenous knowledge systems and to enhance their status. Atlas Jeune Afrique. Burkina Faso, 1998. Balima, Salfo-Albert. Légendes et histoires des peuples du Burkina Faso, 1996. Breuser, Mark. On the Move: Mobility, Land Use and Livelihood Practices on the Central Plateau in Burkina Faso, 1999. Englebert, Pierre. 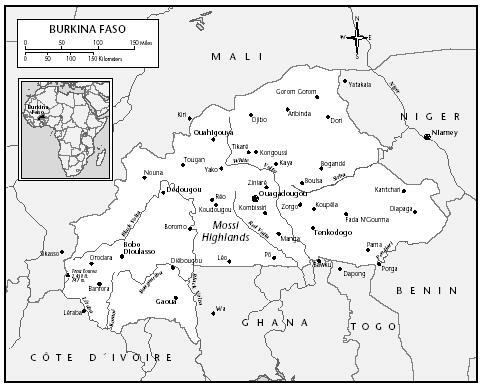 Burkina Faso: Unsteady Statehood in West Africa, 1996. Guissou, Basile. Burkina Faso un espoir en Afrique, 1995. Ilboudo, Jean. Burkina 2000: Une eglise en marche vers son centenaire, 1996. Kambou-Ferrand, Jeanne-Marie. Peuples volta 1 ïques et conquête coloniale 1885–1914, Burkina Faso, 1993. Klotchkoff, Jean-Claude. Le Burkina Faso aujourd'hui, 1998. Kedrebéogo, Gérard. "Linguistic diversity and language policy: The challenges of multilingualism in Burkina Faso." Hémisphères 12: 5–27, 1997. Lear, Aaron. Burkina Faso, 1986. Madiéga, Géorges. "Les parties politiques et la question des fédérations en haute Volta (Burkina Faso)." In Ageron, Ch. and M. Michel, eds., L'Afrique noire française, l'heure des indépendances , 1992. Massa, Gabriel and Georges Madiéga. La Haute Volta Coloniale, 1995. Savonnet-Guyot, Claudette. Etat et sociétés au Burkina, 1986. Skinner, Elliott P. The Mossi of Burkina Faso: Chiefs, Politicians and Soldiers, 1989. Zagré, Pascal. Les politiques économiques du Burkina Faso: Une tradition d'ajustement structurel, 1994. Are there many articles about Bobo Dioulasso, Burkina Faso. I am currently in school (college) I have to do a research paper on Bobo Dioulasso. I can't seem to find any useable information on the web. Most articles lead to Burkina Faso. Please send links or information where I can download information. This website is really useful we are doing a report in school about one Africa nation that we choose and at first we didn't really enjoy Burkina Faso but then we got to looking and interviewing them and realized that it’s a very interesting, diverse place like our whole world is. Thanks for all the information again. This is an excellent web page. I am doing a report in school about it, and this page gives me all of the information that I need, and also gave me alot of interesting facts. It's great. This website is very informative, I enjoyed refreshing my memory. Iam from burkina faso living in the U.S and it is sometimes difficult to share your culture with others without having an evidence-Based literatures. Whoever created this web page did a wonderful job. thanks a lot and keep it updated. I throughly enjoyed readong this article. I hope to rea another one like it soon. There is no contact information for the operators of this site which is a pity. Most quality sites have some sort of point of contact for corrections, additions and suggestions. There's a typo in the text here. The sentence in question is "Tensions within the government grew until Sankara finally ousted the conservative faction and took over power on 4 August 1993..."
The year is incorrect. The year should be 1983.
very good research. I'm from Burkina Faso and i must confess that this is a first hand research. This article is very good to read. Please try and identify the ethnic groups in the south most especially the Gurunshi tribes and write much about them including political disputes and migration that will be good to read also. Kingdoms like Chakane, Tsebele, Po, Pinda should be covered for a better understanding of the traditional political institutions of these people. I don't have the funds, I would have wish to take this as a project but Kudos to what you have done. We are during a research on our family and it links us back to Burkina Faso and the group is Samoya but it I can't find that group do you think it is the same as Samo? This is a very informative and interesting. are there any traditions of the Nuna indian tribe? i need them for a project for school. what is the diet of the lobi tribe in africa? i nead it by tomorrow for school. I want to know what is the dating tradition of men from Burkina Faso. Is it customary for man to want intimate relations with women before marriage? How do men in the Burkina Faso community view dating standards do's and don'ts? How are women from other cultures and ethnic backgrounds viewed according the people of Burkina Faso? Thank you kindly. Its very lovely and I enjoyed reading about Burkina Faso. Are the Yarigas Burkinabes? Which part of the country do they occupy if they are? I would like to know much about them if they are from that country. It would be very helpful if you had the publication date and company. i am amazed by the content of this web page. really interesting. i am currently in ASA college in New York and i have a presentation about the traditional wedding in burkina faso to do. this is a cool page it has everything I need for a school project! this was very helpful, thanks. although there are much more up-to-date statistics for some of the facts on here, this helped me a lot with my school report. It would be interesting to explore their unique process of psychological treatment, but especially focus on its results, without the perspective of the dogma of our psychology. Perhaps we have it all wrong. Perhaps we miss the spiritual (not religious) component of the human. We are too concerned with labeling what we don't explore nor understand as cultist. There is much study on the brain during spiritual practices, such as meditation, and their direct results on biology and mental states. Perhaps there is more to it, like there's more to invisible air. I love your website. I use this as a site for a school project and my teacher wanted to know where i got the info, and i told him your website and said that this is a great source to use. Thank you so much! I truly enjoyed this information. I am doing a research on Wedding Tradition and fabric/styles. I am going to Panama, Rep. of Panama for a presentation of Afrikan Traditional Weddings. In the month of May, blacks in Panama are celebrating 'Dia De La Etnia Negra"
I will continue to research. In the 90's I met visiting Officers from Burkino Faso while I attended the Black Fashion Museum/Institute, Harlem, New York (Manhattan USA. Your website is fabulous.It has precisely helped me tremendously to figure out Burkina Faso'S national culture.My wife Dr Tracy Williams visited the Country recently and used to share great stories about Burkina Faso and because of your website, I totally agree with her and am looking forward to also visit the Country in the near future. This is a wonderful report on Burkina Faso! It could be even better with references to research by African Art History Professor Christopher D. Roy at the University of Iowa. He has conducted fieldwork on art among many peoples in Burkina for over 40 years. Thank you so much for presenting all of us with such details for several topics on the Burkinabe people and their country. I'm taking an African cinema course and we watched a movie, "Bintou" (the 2001 movie), about a woman pushing for her daughter to get her education by starting her own business, growing millet sprouts (usually a man's task). And the movie takes place in Ouagadougou. Again, I'm thrilled to have found this site, it's helped me learn more about the place's culture and people. Thank you! I am glad to learn about this hidden African country. Pretty much Burkinabe women are submissive and unequal when it comes to men. Hi, thank you so much for such a complete informative article! It's a great starting point to research I'm currently doing. I am from Burkina Faso but I've been living abroad for a while. It was really interesting to learn about things I wasn't aware of (I'm most familiar with Mossi culture). Please keep this updated, it's a fantastic piece of work!